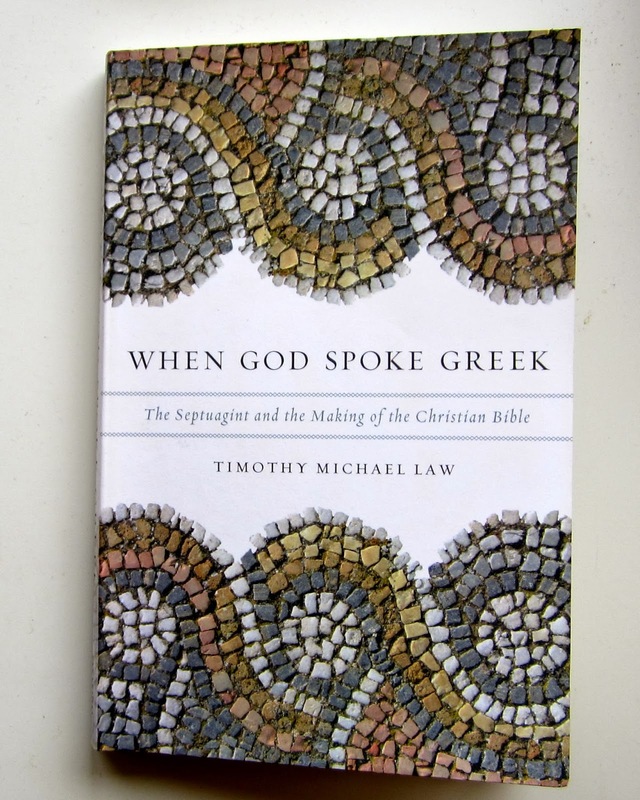 In chapter three Michael Law presents one of the most important ideas in his book, When God Spoke Greek. This important idea is summarized in the quotation from Eugene Ulrich that opens the chapter: “We should probably not think of a ‘Bible’ in the first century BCE or the first century CE at Qumran, or elsewhere.” In the first paragraph of the chapter Law clarifies what Ulrich means; he asserts that before the second century CE “there was no way of knowing which scriptural books would be included within the collection and which would be left out; nor was there any way of knowing how the final version of the individual books would appear.” This is the main thesis of the chapter, and there are two issues here. The first involves the books included in the canon of the Hebrew Bible, and the second involves the form, or textual makeup, of those books. (If you are not sure what we mean by some of the terms we are using, look back at pages 7-8.) I will briefly address the first issue, since Law does not enlarge on it, and I will spend more time responding to the second one, which is the main thrust of the chapter. The main problem I have with Law’s statement about the canon is that, in my opinion, it is too far-reaching. The Prologue to Sirach from the second century BCE refers to a three-fold division of the Hebrew Bible, and several passages indicate that at least by about that time there was a belief that prophecy had ceased (Zech 13:2-6; 1 Macc 4:46; 9:27, 54; 14:41), thus limiting the books considered for the collection. Further evidence of a collection from the first century CE (Josephus, Against Apion, 8; Luke 24) raises more problems in my mind with Law’s statement about the date of knowledge of which books were to be included in the collection. And the evidence of biblical texts at Qumran with authoritative citations coming virtually only from those texts that were included makes me wonder further if he is not going too far in his statement and in this chapter. It seems to me that by the second century BCE there must have been a core of books that were generally considered to be part of the collection that came to be called the Bible. The second issue, and main emphasis of the chapter, has to do with the diverse forms of the text of the Hebrew Bible before the second century CE and the implications of that fact. I do not dispute the claim that there were different forms of the Hebrew Bible in this period, and Law gives much evidence for it. His chapter is a helpful overview of the evidence for such diversity. However, I wonder if Law may have pushed the envelope a bit too far again when he says things like, “The earlier period was characterized by plurality, not uniformity” (22), and perhaps also his statement that prior to the second century CE there “would have been no way to predict which Hebrew version of any given book would eventually become the standard” (32). Is there any evidence of textual uniformity or of a text that was understood to be a standard text before the second century CE? I think there is. First, I would like to repeat a point I made in my response to Aaron’s review of chapter one. Law focuses almost exclusively on differing or alternative Hebrew texts as the explanation for the differences found in the textual tradition of the Hebrew Bible. In his postscript he does acknowledge more fully that the translator could sometimes be responsible for the differences between the MT tradition and the LXX, and he also mentions that possibility in this chapter but he does not develop it. I am prejudiced on this point, because I work mostly in LXX Minor Prophets (LXX Twelve), and I have found that almost all of the differences between the MT tradition and the LXX in the Minor Prophets can be attributed to the work of the translator. One could also cite the works of Dorival on Psalms; Gentry on Job; and many others, who have argued the same for different books. It is true, the differences in the Twelve between the MT tradition and the LXX are not as major as in Jeremiah and some other books, but there are some big discrepancies between the MT tradition and the LXX in the Twelve and in the vast majority of cases they can be explained as the work of the translator. I think more emphasis on this in chapter three would give a fairer picture of the situation. In presenting some evidence for textual uniformity or a text that might be considered as a standard before the second century CE I point readers to the article by Peter Gentry (“The Text of the Old Testament” JETS 52/1 [March 2009]: 19-45). In this article Gentry presents several arguments against the near consensus view (presented by Law) that the text and canon of the Hebrew Bible were fluid until the end of the first century CE. In doing that Gentry argues for the dominance of the proto-MT text both before and after the fall of Jerusalem. I will mention a few of his arguments, and interested readers can look at his work in more detail and decide for themselves. One of Gentry’s main arguments is the often-overlooked importance of the translator as the cause of differences between the MT tradition and LXX, which I mentioned above. He also argues, following Pulikottil, that many so-called variants in the texts at Qumran actually demonstrate resignification in relation to the mainstream text and presuppose it. He cites Chiesa’s study, arguing that we cannot just count variants between texts or groups of texts, as Tov and others tend to do with Qumran manuscripts; instead we must analyze more carefully the supposed variants for their worth in determining textual relationships. In this regard Chiesa notes two principles that are often forgotten: (1) Only significant errors can be used to determine genetic relationships; and (2) many so-called unique readings that are used to classify manuscripts are not unique and are not reliable for establishing the position of a witness within the text history of that biblical book. Thus, Tov’s category of Non-Aligned Texts needs reexamination (Gentry, 36-37); Law refers to these Non-Aligned Texts as texts that “resist classification altogether” (24; see n. 12). Gentry also argues that the evidence from Qumran needs to be put within the larger picture of all the scrolls from the Judean desert, and all of those scrolls that are not from Qumran are similar to the MT tradition. Gentry claims, “In the larger picture there is a central stream dominated by the proto-Masoretic texts” (37). I have gone on long enough, and I have only touched on Law’s chapter and summarized a few key points in Gentry’s article. However, I trust the reader will understand my point: I am trying to temper some of Law’s statements and argue that there is evidence that suggests that before the second century CE, perhaps as early as the second century BCE, it would be possible to have had a good idea of which scriptural books would be included within the collection and which would be left out; and there is evidence also that, in spite of the diversity of texts, before the end of the first century CE it would have been possible to have had a pretty good idea how the final version of the individual books would appear in that collection. I appreciate Ed's comments above. He is right to temper some of Law's statements while also offering alternative views for which Law does not provide much space. However, I do find Law's arguments a bit more compelling than Ed does. However, Ed's point still stands that Law may be reaching a bit too far in his statement. "No way of knowing" comes off a bit strong. Permit me this experiment (that I can in no way prove): If you were to sit a 1st Century CE Jew or Christian down and ask, "If you had to create a canon of Scripture, which books would be included?" What would he or she say? I'd be willing to bet that the majority would at least include the Torah and Isaiah if not also Psalms. I know it is a silly hypothetical, but the point I am attempting to make is that they were readers/hearers of Scripture, that they had a conceptual category for what was "Scripture," that this category was probably a graded one (in that something like Torah or Isaiah would be considered the more Scripture-y Scripture), and that in making a canon, hearers/readers from the same socio-historical-cultural-religious context would certainly include those more prototypical examples of Scripture. I do agree with Law that the entire canon could not have been known before it was finally delimited (both because some books were not as prototypically "Scripture" like the Torah or Isaiah and because, as he will get into later, there was a wide range of Scripture in use, not all of which ended up being included in the canon), but the way he makes his claim is a bit overstated. On the second point of Ed's review, I think he again helpfully tempers Law's claims. Law does not spend much time on the issue of changes that occur because of the translation process. However, the issue of divergent literary traditions underlying certain biblical books like Jeremiah or Samuel cannot be explained by the changes that occur in the translation process. Law helpfully points the reader to the plurality of texts that existed before the MT became the most prominent and other textual traditions were edged out. Not only do we have witnesses to other traditions for many books, but as Law states, some of these traditions are more ancient than what we have in the MT! This is often ignored in Christian scholarship because it makes our reading of the Old Testament messy. However, if we want to be honest, good, and faithful readers of Scripture, we must follow the evidence and wrestle with it. I appreciate that Law exhorts the reader to not view the evidence through the lens of someone coming to it after the authoritative tradition had been established (p. 32). While we cannot stop this from being the case ontologically, he is right to remind us that we naturally view the data from this perspective and as a result, the data will necessarily be skewed. I find the challenge to try to remove that lens to be a very helpful and important one. There is not space to discuss what all I appreciated about this chapter, but I certainly recommend anyone interested in the issues briefly discussed in this review to engage with it. While Ed and I come away from the data with slightly different conclusions, I appreciate his review and think he helpfully tempers Law and presents counterarguments with which one must also wrestle. Full diclosure: this was one chapter I was especially excited to dip into, for many reasons, but the primary one being that I was able to hear Ed's response on it. I was not disappointed, That was good stuff, and demonstrates his word-class knowledge on the subject that many have seen in his wonderful dissertation on the LXX-Amos. Great interaction so far, I hope I can add my own nugget! Ok. Enough brown-nosing! I would like to touch on two things that might be more implications of the issues Ed and Chris are discussing above. The first is on the issue of multiple forms, and the second is on the pastoral angle of this chapter. First, Law says that some books like Exodus, Samuel, Kings, Jeremiah, etc., have multiple literary versions in extant, while other books do not. He says, however, that the lack of multiple versions for some does not mean that those books have never had multiple versions. But it is what he says next that bears more explanation. He says that "the preservation of evidence for only some of them is a matter of accident..." On two fronts, I found "accident" to be a bit problematic. In both cases I do not believe that such preservation of texts is by accident. The first reason I would propose is that according to a classic canonical approach, the people of God looked to Scripture for worship and a normative expression of God's will in their times (this is a much more human-centered method, e.g. "prophetic oracles which were directed to one generation were fashioned into Sacred Scripture by a canonical process to be used by another generation." Childs “Canonical shape," Interp. 32, no. 1 : 46). This fact has many implications for the multiple forms of texts, and the lack-there-of in other cases. Multiple versions of texts may have been preserved purposely for their distinct directives to a new generation of God's people, whereas other texts were left as they are, or if multiple, discarded for lack of use in the worship of the people of God. The second is a stance of the more confessional and evangelical church. Concerning the matter of canon and the plurality of texts, the matter is never one of an "accident" because it is God who establishes his word for his people (this in many ways is contrary to Child's approach in its orientation). This may be a hard saying for many in academia. And many may think we have "progressed beyond those primitive ideas." A view of canon like this one runs into problems even in the 21st century since among major Christian groups there exists a plurality of canons! However, the problem does not render the point true that God establishes canon, and his people recognize what this canon is. We do not ever arbitrarily trash certain books (as the monks nearly did to the entire text of Sinaiticus! ), and/or accidentally preserve others (like those in Cairo did with old mss.). The development of canon and preservation of texts is of primary concern of the LORD since it is his word. The second issue running through my head while reading this chapter is who is this book for? In other words, as Ed and Chris say above, Law strongly states some very controversial things without caveat. For me, who spends half my time in the local church, I am concerned for the reader. If this book is solely for people like myself, Chris, Ed, then statements these and chapters like this one can be discussed and hashed-out. However, this book looks to be more "popular" level, and seems to be aimed more at a popular level in its verbiage, etc., as well. What this chapter reminds me of are the unqualified statements I heard in my undergraduate years that either intentionally undercut the young faith of many students or unintentionally did so for lack of explanation. I think there is room in this chapter, or in the introduction, to name some of the issues as tough to navigate, but noting that raising of such issues is to be faithful to engage the problems of faith - not to undercut faith. Issues covered in this chapter and interacted with great skill above by Ed and Chris are vital to discuss, however, the intended audience must be taken into consideration since these issues have important implications for the faith of God's people. I won't add too much here but just that Drew Longacre published the following article: Drew Longacre, “Developmental Stage, Scribal Lapse, or Physical Defect? 1QIsaa’s Damaged Exemplar for Isaiah Chapters 34-66,” Dead Sea Discoveries 20 (2013): 17-50. This is an important article on the Isaiah situation and I believe successfully refutes Ulrich's textual growth thesis in Isaiah, which he published: Eugene Ulrich, “The Developmental Composition of the Book of Isaiah: Light from 1QIsaa on Additions in the MT,” Dead Sea Discoveries 8,3 (2001): 288-305. Law probably could not have accessed Longacre's article in time for his publication, but Drew's theory is far better than any which assumes and does not prove textual growth of the book of Isaiah. In terms of actual Hebrew variant literary editions, how many have real substantive evidence? I'm willing to grant Jeremiah, Samuels, Kings. Any more that I should be willing to grant? Of course a variant literary edition does not necessarily indicate textual fluidity in the Ulrichian sense. There are other explanations of these matters. Thanks again for the sweet dialogue. John, I think you may also want to consider other sections of books like Exod 35-40 and 1 Sam 16-18; see the discussion in Marcos, The Septuagint in Context, 79-83. The way I read Marcos he does not see the necessity to add any other complete books to the ones you have mentioned. Thanks for the reference to the Longacre article. Thanks, Ed. I will look into Exodus.